I don't know about you, but I love to receive thank you cards / notes / letters. Sadly, thanks in part to modern technology, I think the tradition of sending thank you cards has almost completely vanished. It's so much easier [& cheaper] to send an email / text / tweet to show your appreciation. As you can see, they're not fancy. 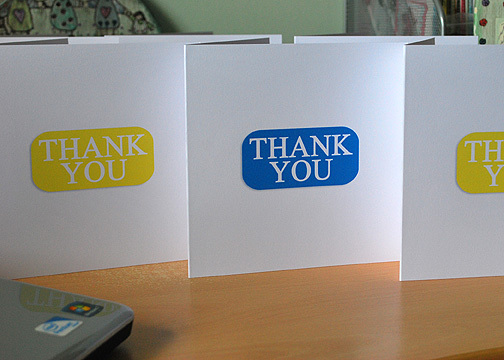 They're just a simple printed card, with a heartfelt message of thanks handwritten on the inside. What about you, do you send thank you cards / notes / letters?